Frankfurt, 1946. David Bermann (Moritz Bleibtreu) and his Jewish friends have escaped the Nazi regime and are now dreaming of leaving for America. But how will they get the money in these tough post-war times? The smooth-talking businessman focuses on what the Germans now need most: fine bed linens nicely wrapped in amusing stories! The six talented entertainers go from home to home, praising housewives with ashy chutzpah until the flattered ladies have no choice but to buy their irresistible items. Business flourishes and a bright new future can be seen in the horizon. But questions about Bermannâ€˜s past catch up with him. Why does he have two passports? What about his visit to Hitlerâ€˜s mountain retreat? Could he have collaborated with the Nazis? The smart and attractive but uncompromising US officer Sara Simon (Antje Traue) refuses to close the interrogation. She wants to get to the heart of Bermannâ€˜s wartime memories. Sara matches his quick wit with iron severity, but it becomes increasingly difficult for her to escape his charm. 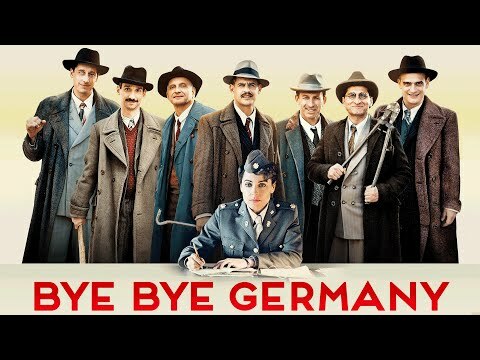 Bye Bye Germany was released on DVD and VOD 257d ago in the US. Notify me when Bye Bye Germany is available.